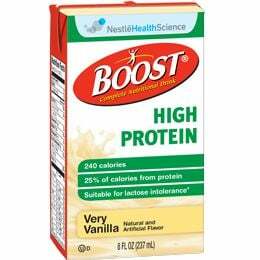 The Nestle Boost High Protein Very Vanilla 8oz Tetra Brik Case of 27, Model #4390094139, is anchored in advanced science and research. Nestle Healthcare Nutrition offers nutritional solutions for people with specific dietary needs related to illness, disease states or the special challenges of different life stages. The Nestle Boost High Protein Very Vanilla 8oz Tetra Brik Case of 27 contains 15 grams of high-quality protein to help maintain muscle. Boost High Protein has 26 vitamins and minerals and is an excelent source of antioxidants (Selenium and Vitamins C &E). Contains Calcilock blend of essential nutrients to help support bone health. Case of 24 Boost High Protein 8oz Very Tetra Brik.